Editor’s note: This is a reprint of a story from last September as a reminder that the Snowmass Balloon Festival is coming up next weekend. A Labor Day family tradition in our house has always been a trip to Colorado Springs for the city’s big balloon festival – the nation’s largest after the one in Albuquerque. Last year, we branched out and took a trip to Snowmass Village for yet another ballon festival – albeit one on a much smaller scale. When it comes right down to it, if you’ve seen one balloon (or a dozen or three dozen), you’ve pretty much seen them all. And there’s no comparison to the overall vibe and scenery of Snowmass Village versus Colorado Springs. 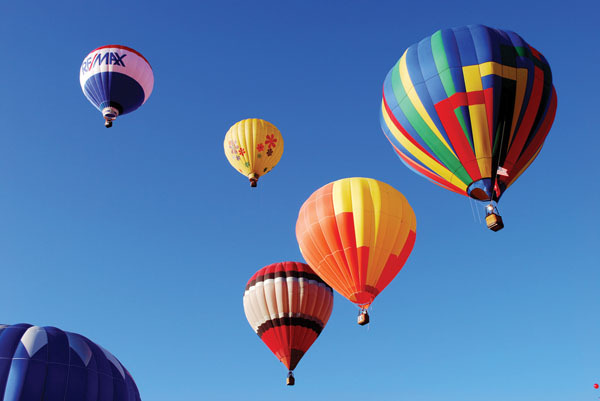 This year’s 36th Annual Snowmass Ballon Festival takes place next Friday through Sunday, just as the aspen are starting to turn in the Roaring Fork Valley and in conjunction with the Snowmass Village Wine Festival. Like most ballon fests, this one includes several “night glows” – events where the balloons stay put on the ground and the crews blast the gas-powered flames into the colorful envelopes. It’s a very cool show, and one the kids will love. A night glows will take place Saturday night, with balloon inflates and launches Friday through Sunday starting at 6:30 a.m. Oh, that’s another thing to know about hot-air balloon festivals: If you want to see the launch action, be prepared to get up early. It’s just after sunrise, when the air is cold and still, that pilots have the best luck flying their crafts. Oftentimes, they’re all done long before lunchtime. At the festival, there are various breakfasts and barbecues to attend, as well as activities for children. Be sure to check with the balloonists to see if you can get on the volunteer list to help crew a balloon – you might also get a ride up in one.As far as wine and food tastings go, it’s tough to beat the Snowmass Village Rotary’s annual fundraiser: the 8th Annual Snowmass Wine Festival. This event begins on Friday evening with a wine dinner at the fabulous Viceroy Snowmass Ballroom and continues with a Saturday grand tasting on the Snowmass Mall from 1-5 p.m. What’s great about this festival is that, in addition to samplings of over 300 different varieties of wine, there are also tasting tables full of regional cuisine. Compared to other events like this where there’s plenty of wine but not enough food, the Snowmass Wine Festival allows you to try plenty of wine while keeping your belly full of great food. It’s sinfully indulgent, but hey, it’s the last hurrah for summer.The wine festival also includes live music and a silent auction, tickets are $75 (and worth it). Check out more details at http://www.snowmassrotary.org. Just like in Summit County, lodging in Snowmass is relatively cheap this time of year, with deals from $69/night. For more info, check out http://www.snowmasstourism.com or http://www.snowmassballoon.com.